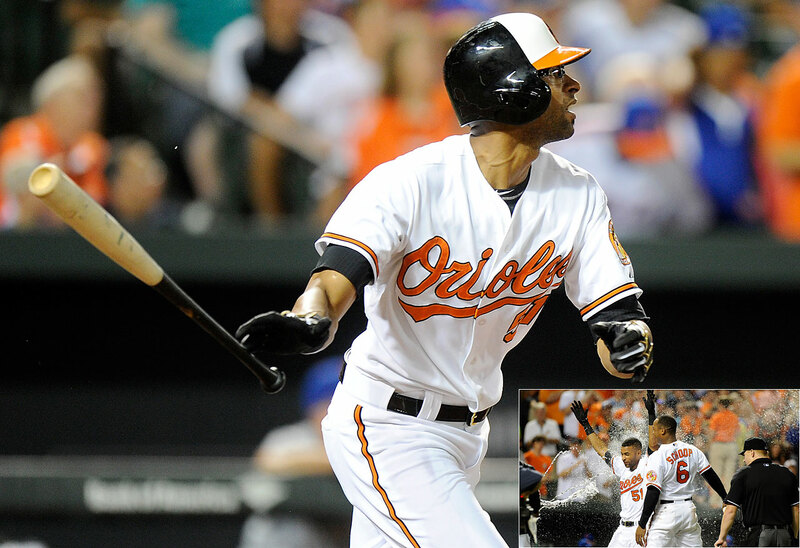 Baltimore Orioles leftfielder Henry Urrutia hit a walk-off home run Wednesday night against the New York Mets for his first career home run. With the game tied 4–4, Urrutia led off the bottom of the ninth after Mets reliever Carlos Torres entered for Tyler Clippard. On the fifth pitch he saw, a 92-mph fastball, Urrutia lined the ball the opposite way for the game-winning home run just over the leftfield wall at Oriole Park at Camden Yards. 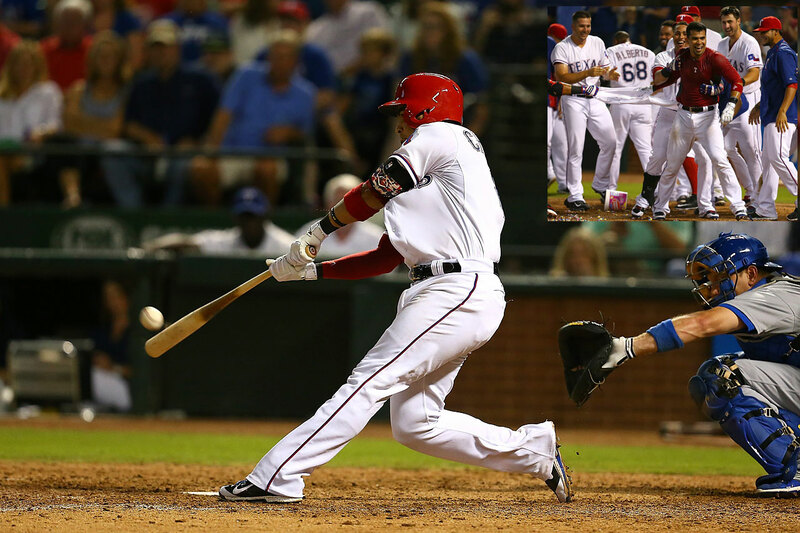 The home run was Urrutia’s only hit in four at-bats during the game. The 28-year-old Cuban was recalled from Triple A Norfolk on Saturday and has started five consecutive games, going 4 for 19 with five RBIs and three runs scored. 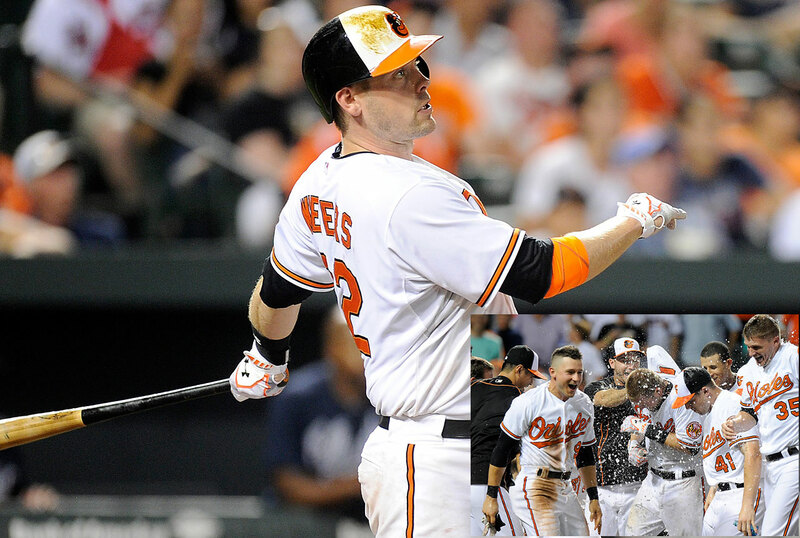 Chris Davis of the Baltimore Orioles is greeted as he crosses home plate after hitting a solo home run during the 11th inning to beat the Tampa Bay Rays 7-1 on Sept. 2. 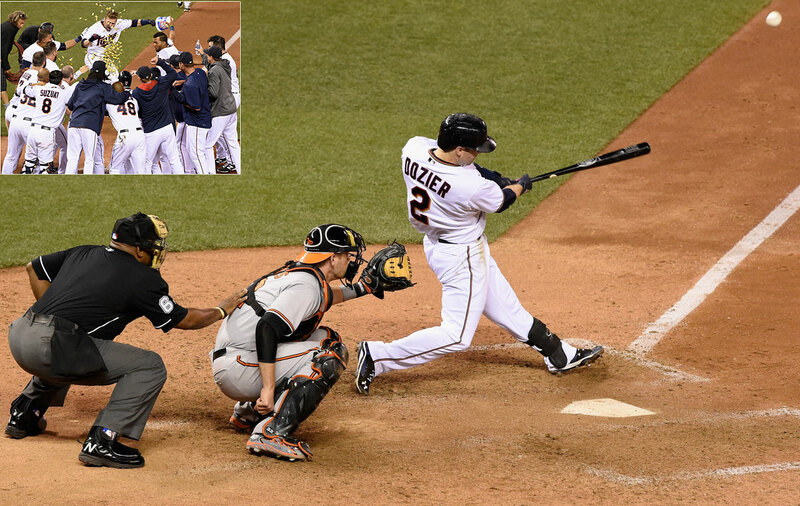 Here are the other players who've gone yard this year to end a game. 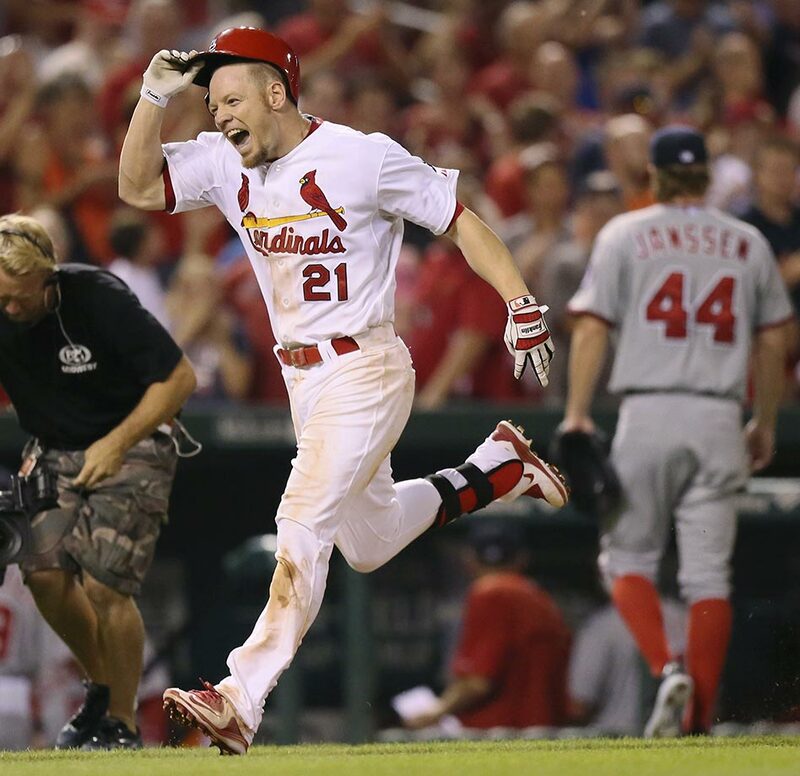 Brandon Moss of the St. Louis Cardinals rounds the bases after hitting a walk-off, three-run home run in the ninth inning against Washington Nationals pitcher Casey Janssen on Sept. 1. The Cardinals won 8-5. 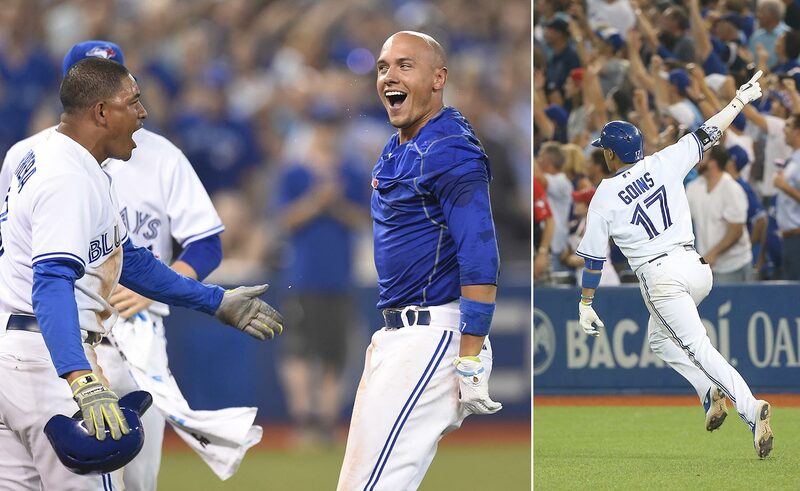 Ryan Goins of the Toronto Blue Jays celebrates his two-run, walk-off homer against the Cleveland Indians. Toronto won 5-3 in 10 innings. Kris Bryant of the Chicago Cubs watches his walk-off shot against the Cleveland Indians, which came with two out in the ninth inning. 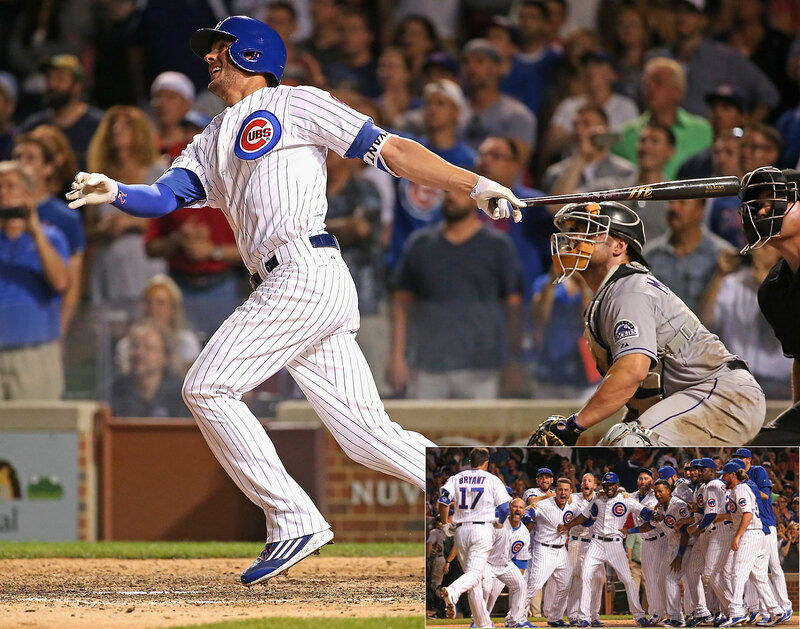 The Cubs beat the Indians 2-1. 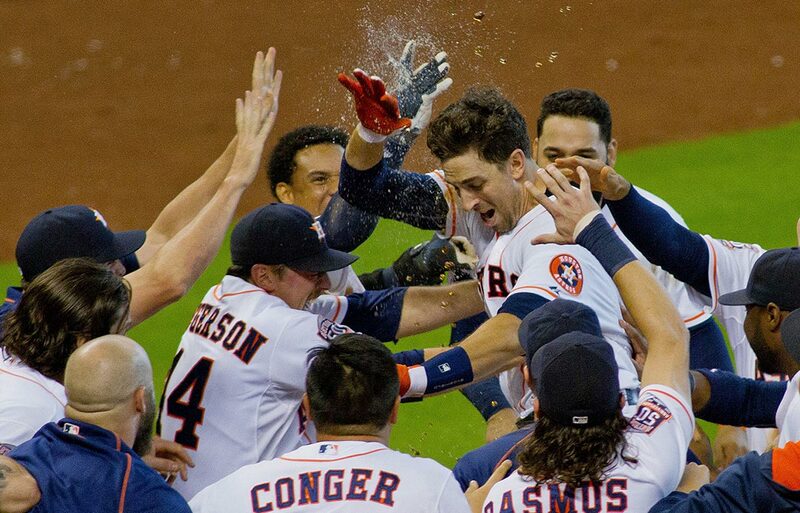 Jason Castro is greeted by teammates after his walk-off home run against the Los Angeles Dodgers in the tenth inning gave the Astros a 3-2 victory on Aug. 23. 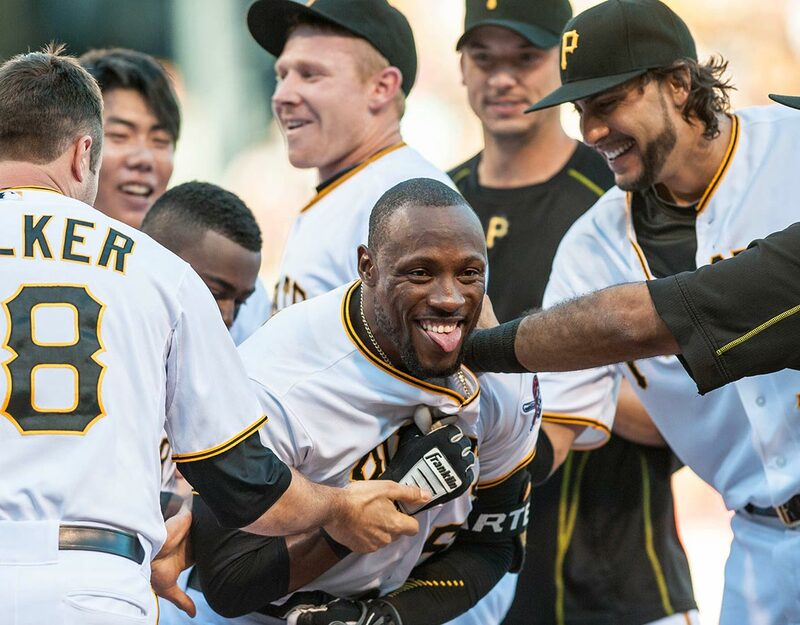 Pittsburgh left fielder Starling Marte is mobbed by his teammates after hitting a walk-off home run in the ninth inning to give the Pirates a 3-2 win over the San Francisco Giants on Aug. 22. Herny Urrutia gave the Baltimore Orioles their third walk-off home run in six days with a solo shot off the New York Mets in the ninth inning on Aug. 19. 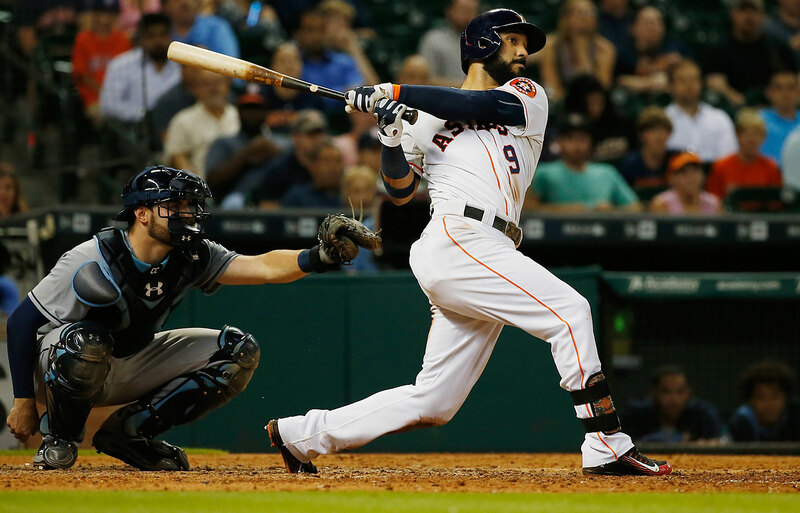 On a night in which he made his first start of the season in left field, Marwin Gonzalez delivered a walk-off home run in the 10th inning on Aug. 18 to give Houston a 3-2 victory over Tampa Bay. 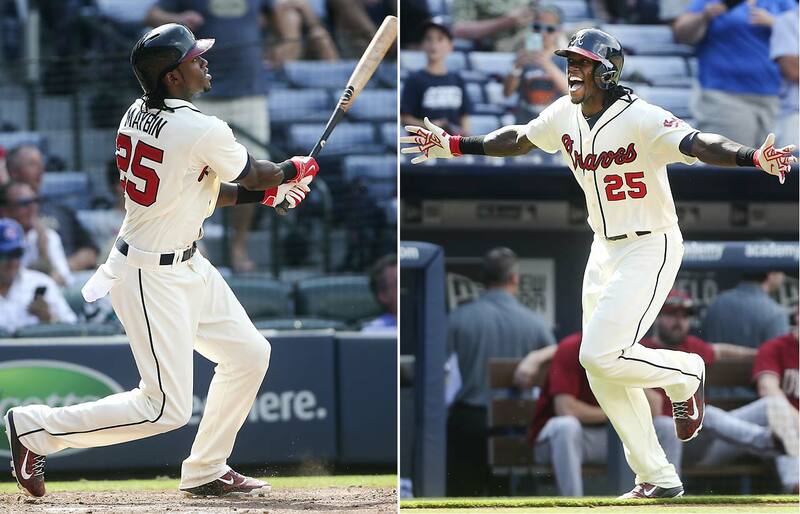 Cameron Maybin hit a solo home run in the 10th inning on Aug. 16 to give the Atlanta Braves a 2-1 walk-off win over Arizona. 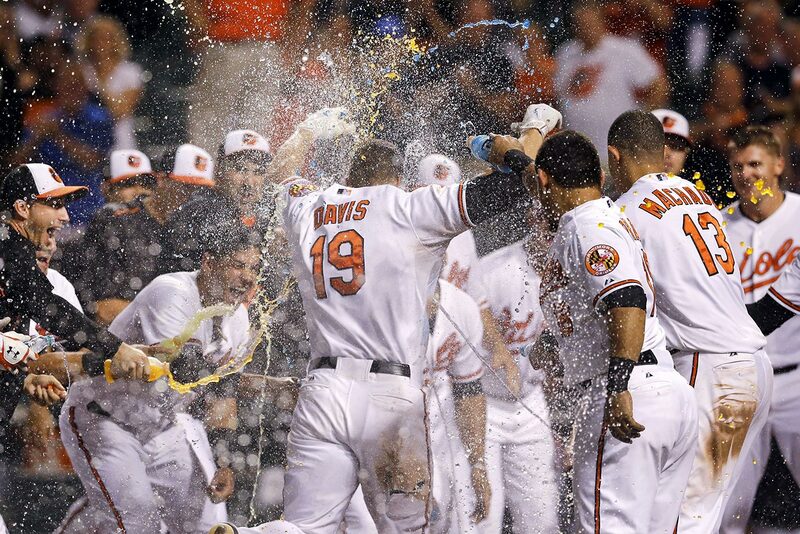 Chris Davis delivered a walk-off home run in the ninth inning against the Oakland Athletics on Aug. 15 to give the Baltimore Orioles a 4-3 win—their second walk-off victory in as many nights. Manny Machado hit a two RBI walk off home run against the Oakland Athletics in the 13th inning on Aug. 14 to give the Baltimore Orioles an 8-6 win. 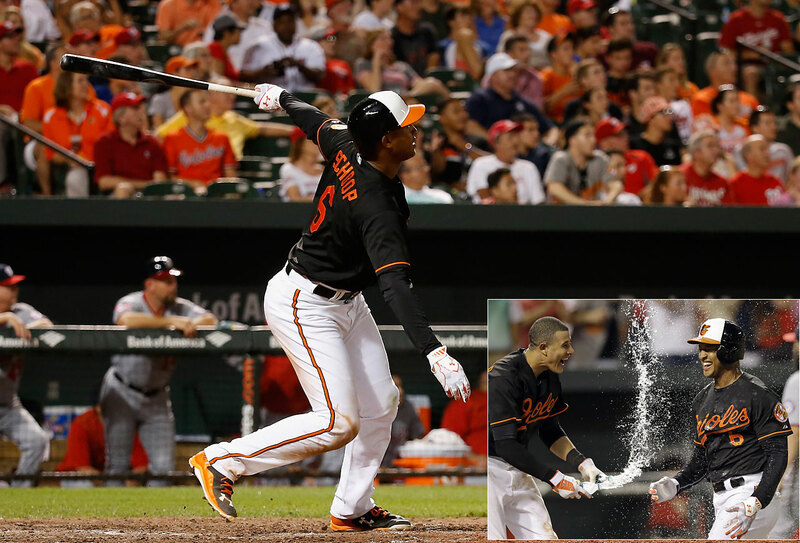 Manny Machado is sprayed with water by teammate Jonathan Schoop after hitting a walk off home run. 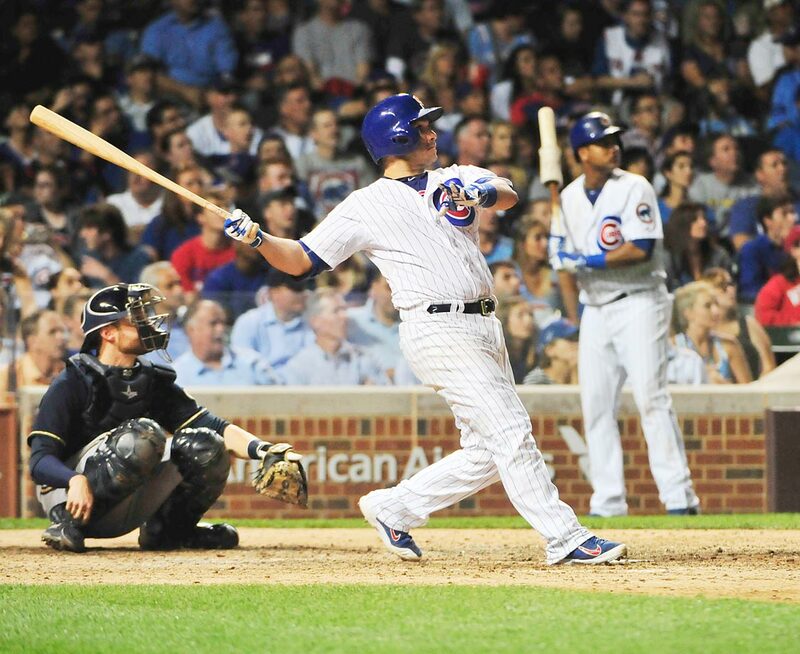 Miguel Montero blasted a solo home run in the 10th inning of an Aug. 12 game to give the Cubs a walk-off, 3-2 victory over the Milwaukee Brewers. 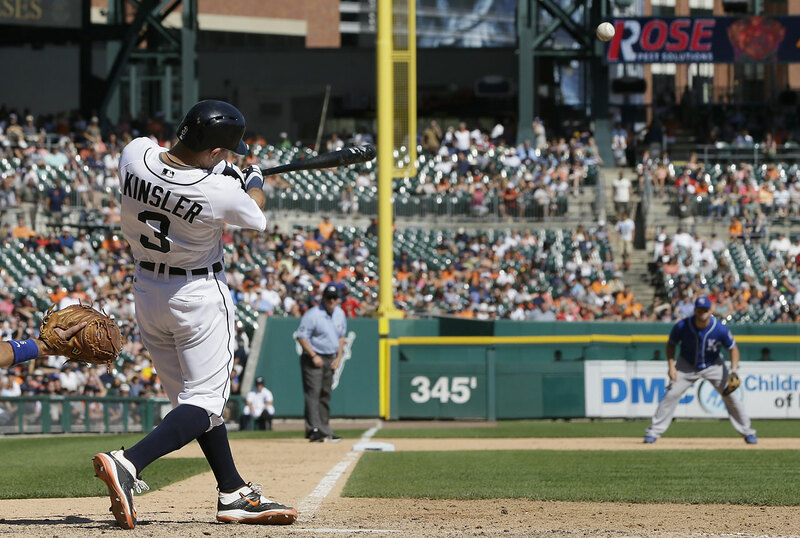 Ian Kinsler connected on this two-run walk-off home run in the ninth inning to give Detroit an 8-6 victory over the Kansas City Royals on Aug. 6. 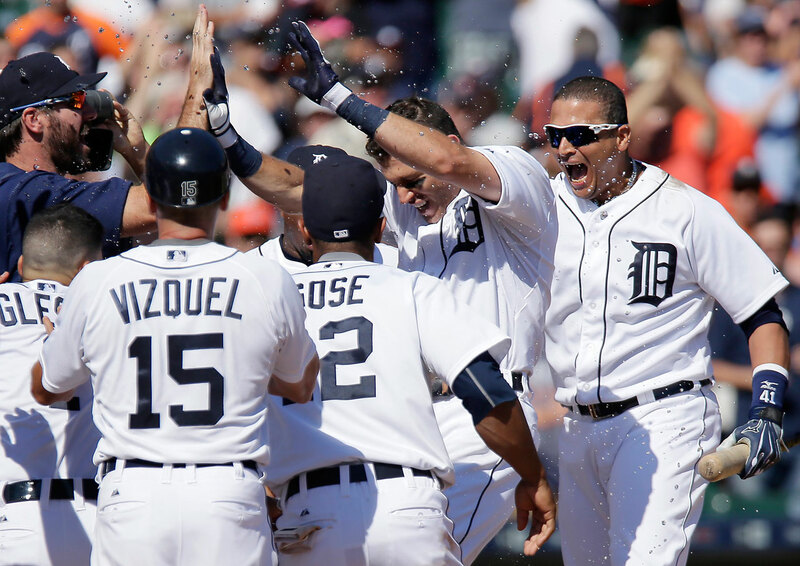 Ian Kinsler celebrates with Justin Verlander(35) Jose Iglesias (1), first base coach Omar Vizquel (15), Anthony Gose (12) and Victor Martinez (41) after his walk-off home run. Michael McKenry watches his game-winning two-run home run off the Seattle Mariners give the Colorado Rockies a 7-5 win in 11 innings on Aug. 5. 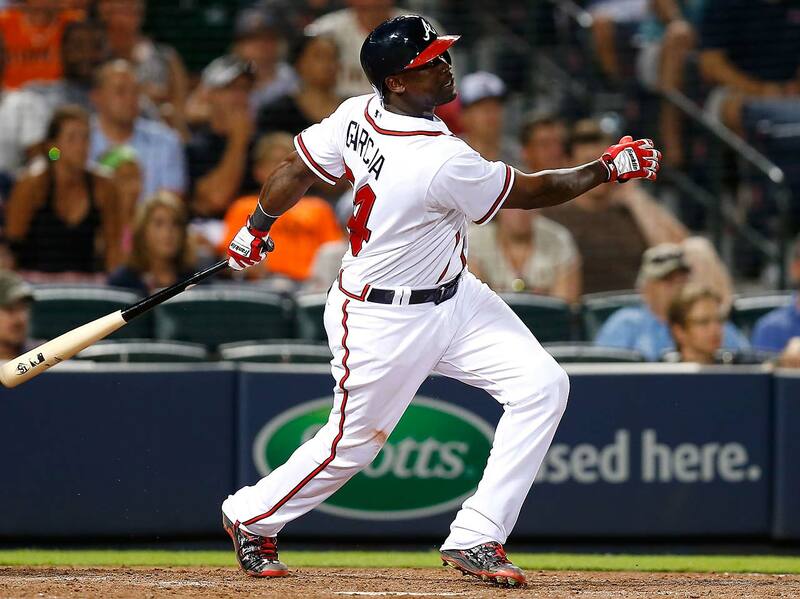 Adonis Garcia hit a two-run walk-off homer in the 12th inning to give the Atlanta Braves a 9-8 victory over the San Francisco Giants on Aug. 3. 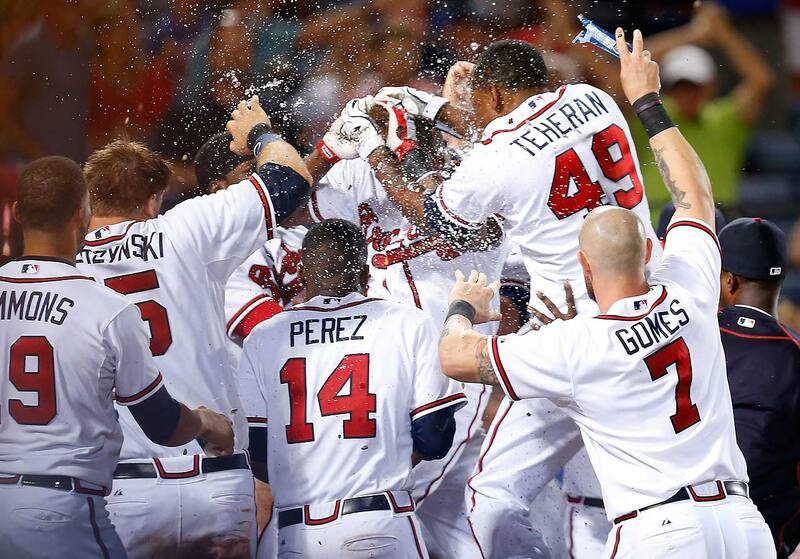 Adonis Garcia (24) is mobbed by teammates after hitting a game winning, two-run home run in the 12th inning against the San Francisco Giants at Turner Field. 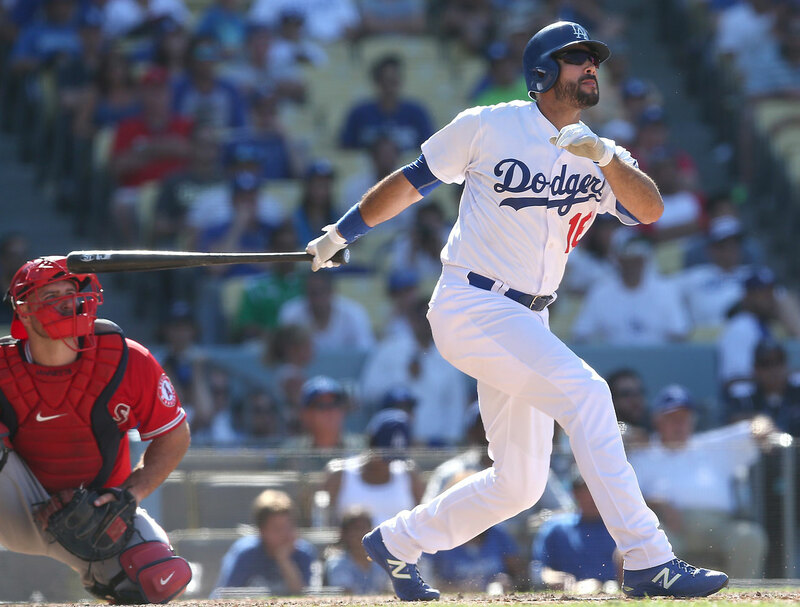 Andre Ethier watches his two-run home run leave the stadium in the 10th inning to give the Dodgers a 5-3 victory over the Angels. 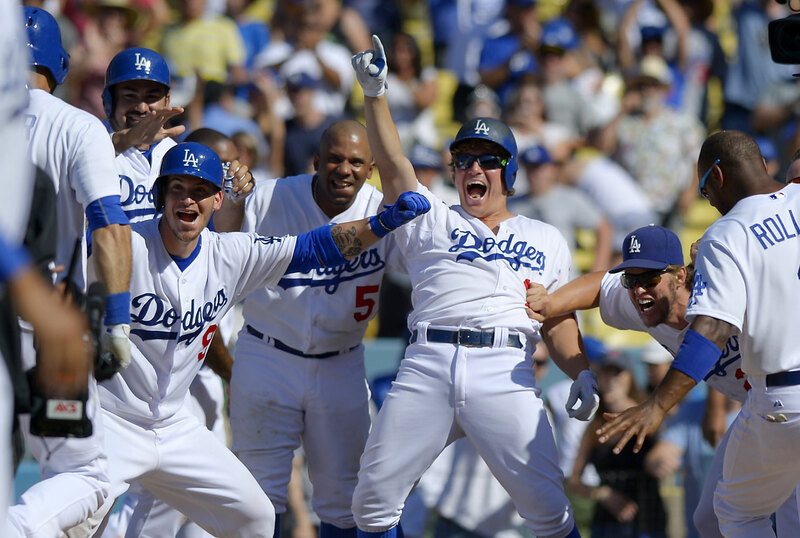 Members of the Los Angeles Dodgers wait at home plate for Andre Ethier, left, after Ethier hit a two-run home run in the 10th inning to give L.A. a 5-3 victory over the Angels on Aug. 2. 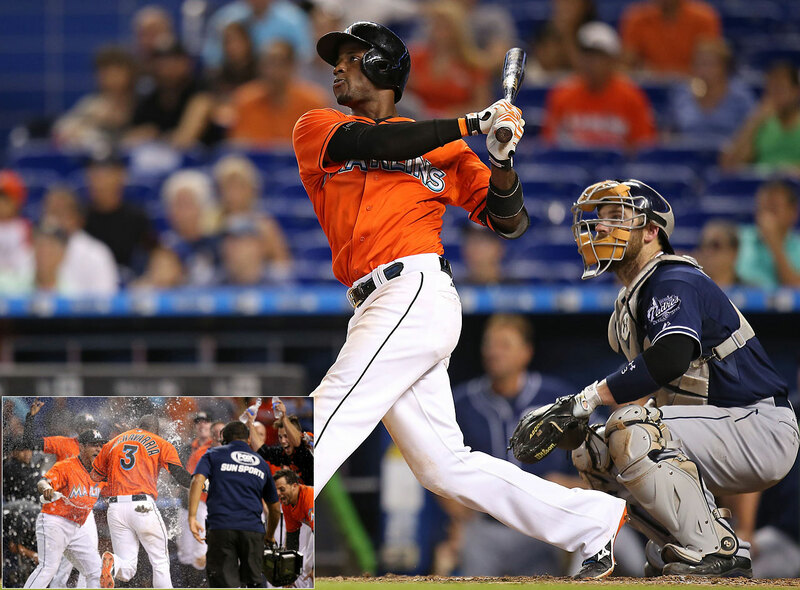 Adeiny Hechavarria of the Miami Marlins hit a three-run walk-off home run to give the Marlins a 5-2 win over the San Diego Padres on Aug. 2. 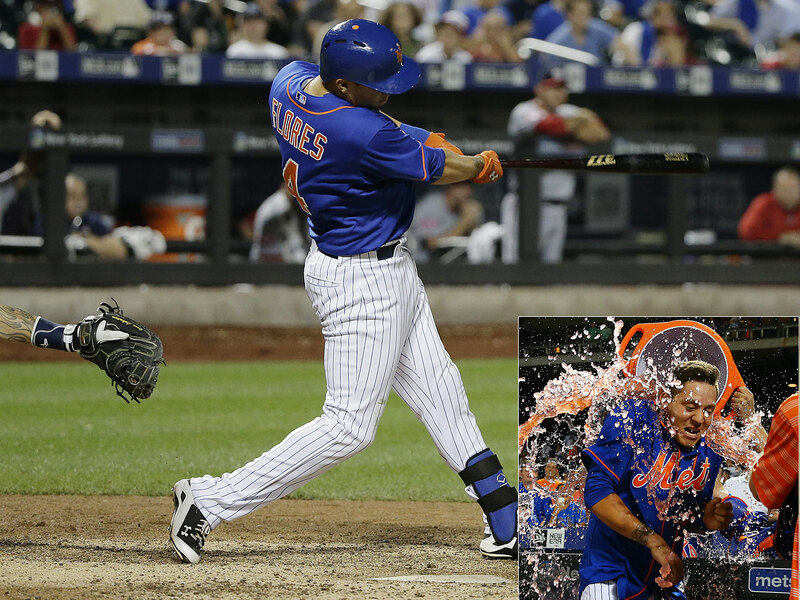 A few days after sobbing while positioned in the field and thinking he had been traded from the Mets, Wilber Flores belted a solo homer in the 12th inning to give New York a 2-1 win over the Washington Nationals on July 31. Jason Castro hit a three-run homer with two out in the ninth inning to give the Houston Astros a 3-0 victory and a three-game sweep of the Los Angeles Angels on July 30. 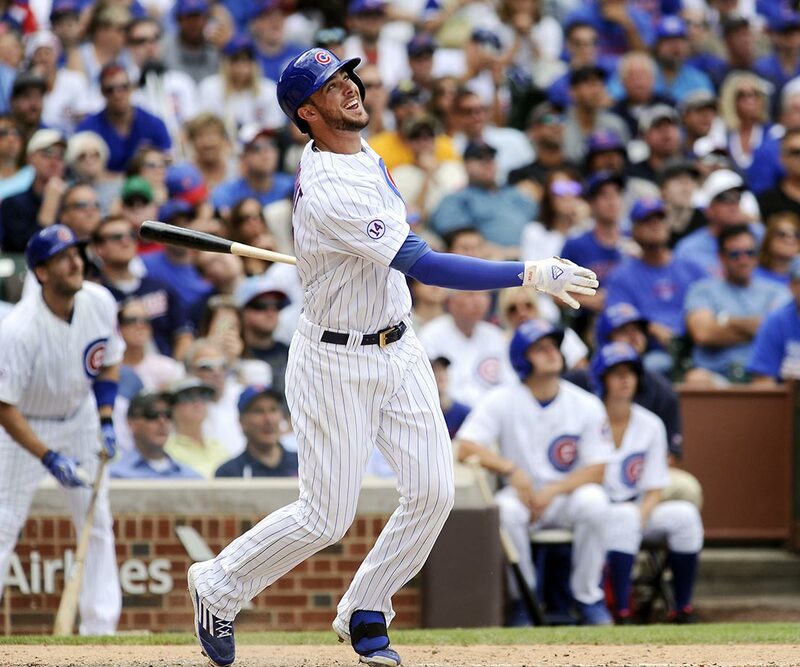 With his team trailing by a run with two out in the ninth inning of a July 27 game against Colorado, Kris Bryant hit this two-run homer to lift the Cubs to a 9-8 victory. 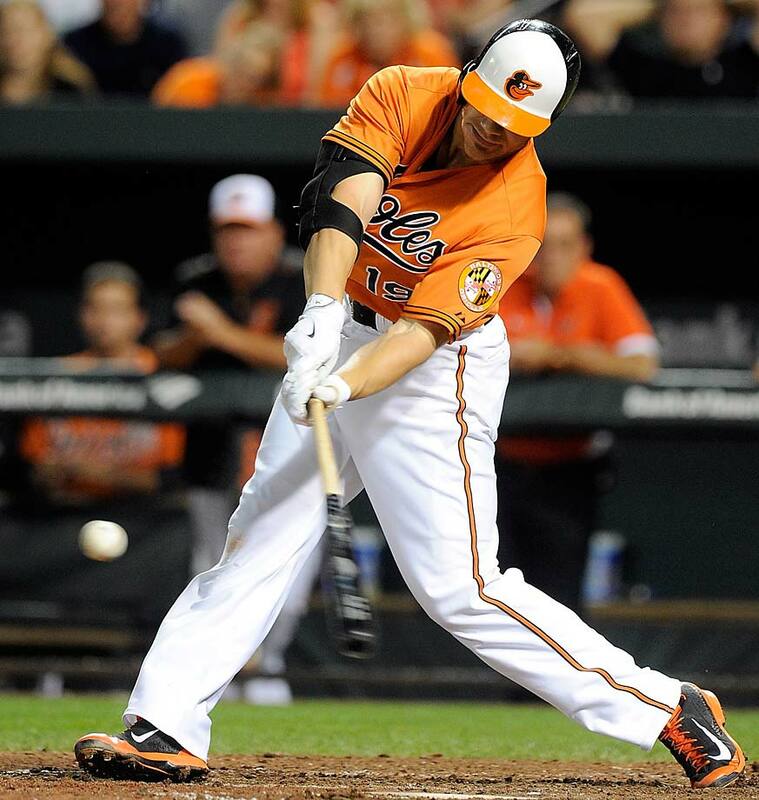 Matt Wieters belted a solo shot in the 11th inning of a 2-1 victory over the Atlanta Braves on July 27. 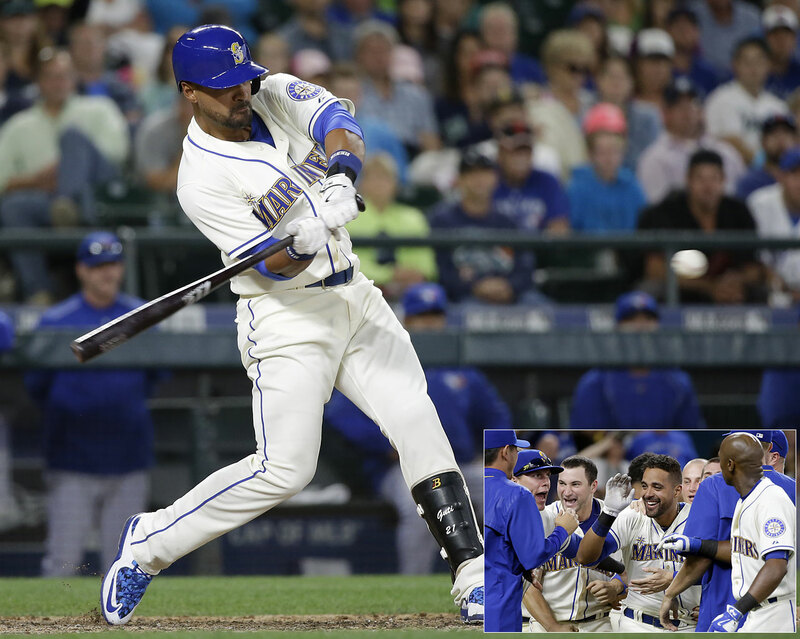 Seattle's Franklin Gutierrez gave the Mariners a 6-5 win with this 10-inning solo home run against the Toronto Blue Jays on July 26. 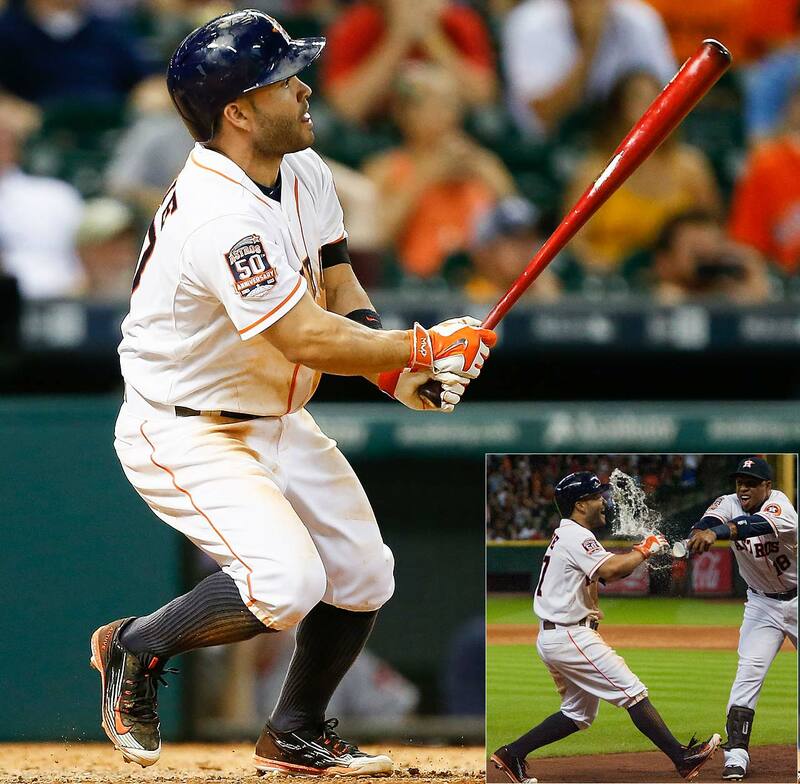 Jose Altuve delivered a solo shot in the ninth inning on July 23 to give the Houston Astros a 5-4 victory over Boston. 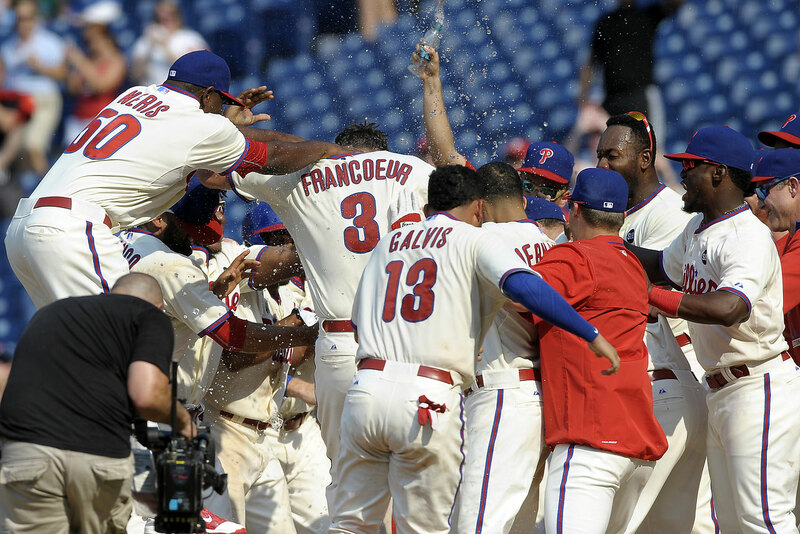 Philadelphia's Jeff Francoeur two-run shot on July 19 gave the Phillies an 8-7 victory over the Miami Marlins. 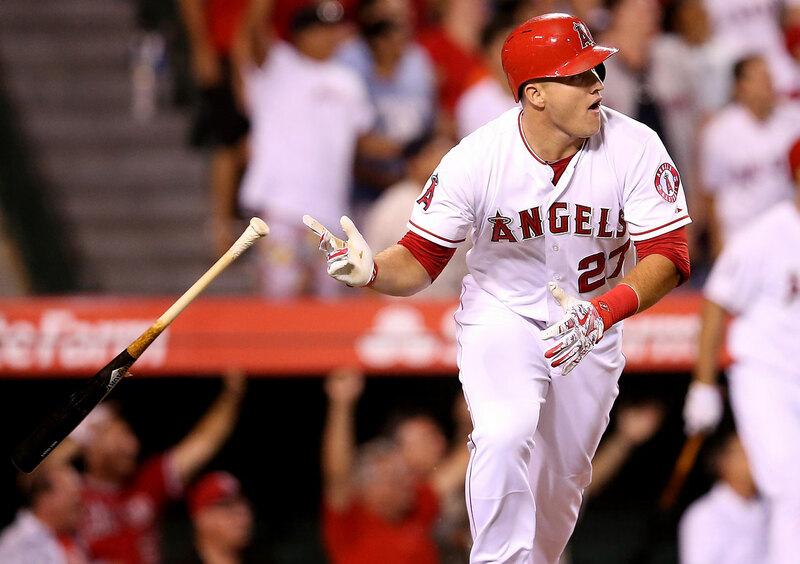 Mike Trout powered the Los Angeles Angels to a 1-0 win over the Boston Red Sox with a solo home run in the ninth inning on July 17. 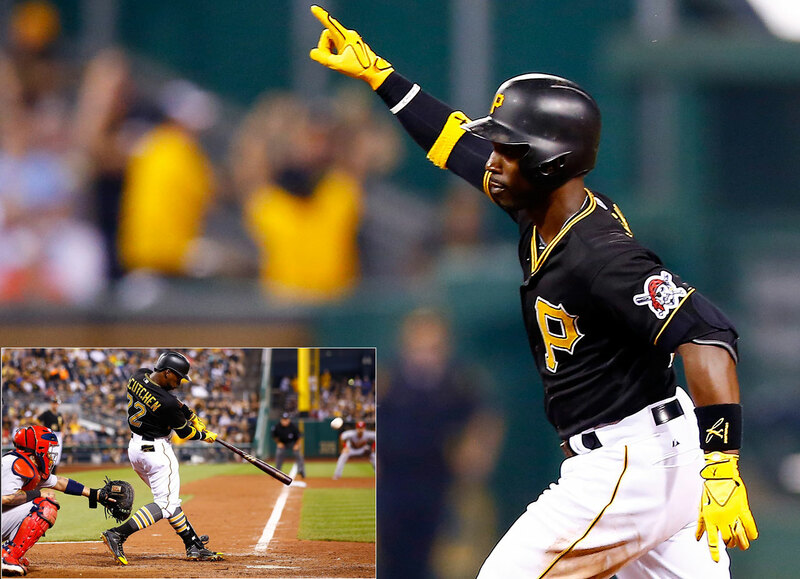 Andrew McCutchen hit a two-run homer in the 14th inning on a July 11 game to give the Pittsburgh Pirates a 6-5 win over the St Louis Cardinals. Jonathan Schoop's first career walk-off hit, a solo home run in the ninth inning, gave the Baltimore Orioles a 3-2 win over the Washington Nationals on July 10. Brian Dozier leaps into the air as teammates wait to congratulate him on a walk-off, three-run home run in the ninth inning that gave Minnesota an 8-6 victory over Detroit on July 10. 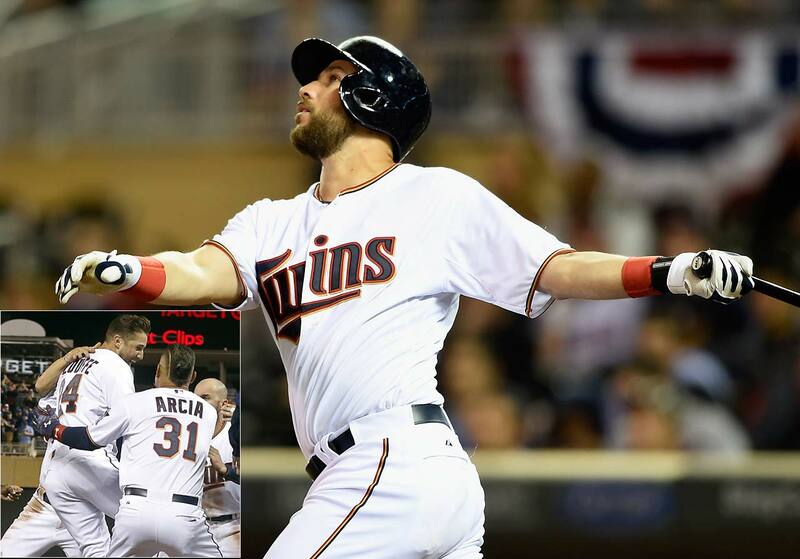 The Twins scored seven runs in the ninth inning to erase a 6-1 deficit. 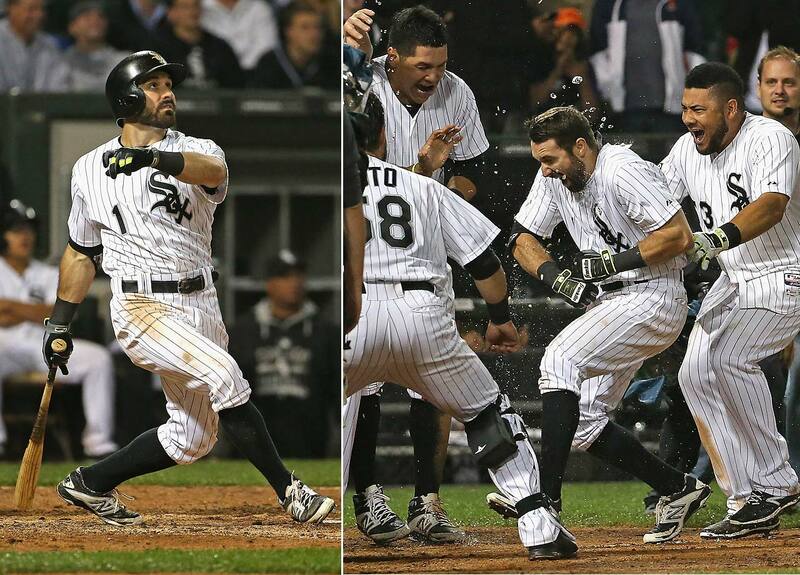 Adam Eaton of the Chicago White Sox hit a solo shot in the 11th inning on July 8 to defeat the Toronto Blue Jays 7-6. Kansas City's Paulo Orlando grand slam in the ninth inning gave the Royals a 9-5 victory over Tampa Bay on July 7. Brian Dozier drilled a two-run homer during the 10th inning of a July 6 game at Target Field in Minneapolis to lift the Twins over the Orioles 4-2. 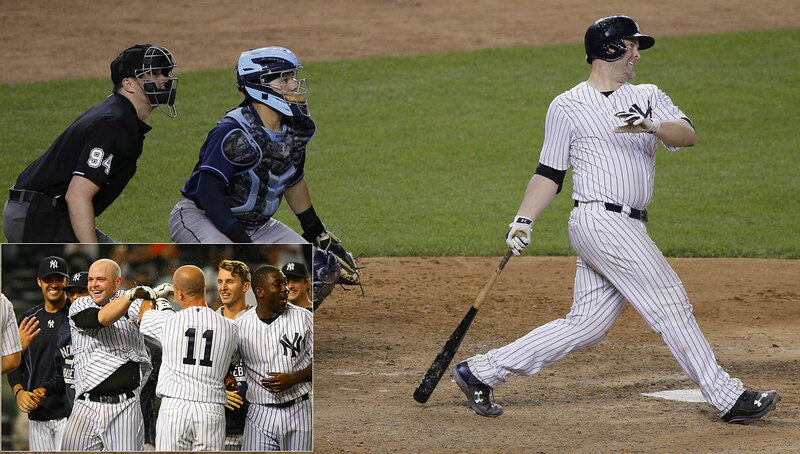 Brian McCann hit a three-run homer in the 12th inning on July 3 to give the New York Yankees a 7-5 walk-off victory over the Tampa Bay Rays. 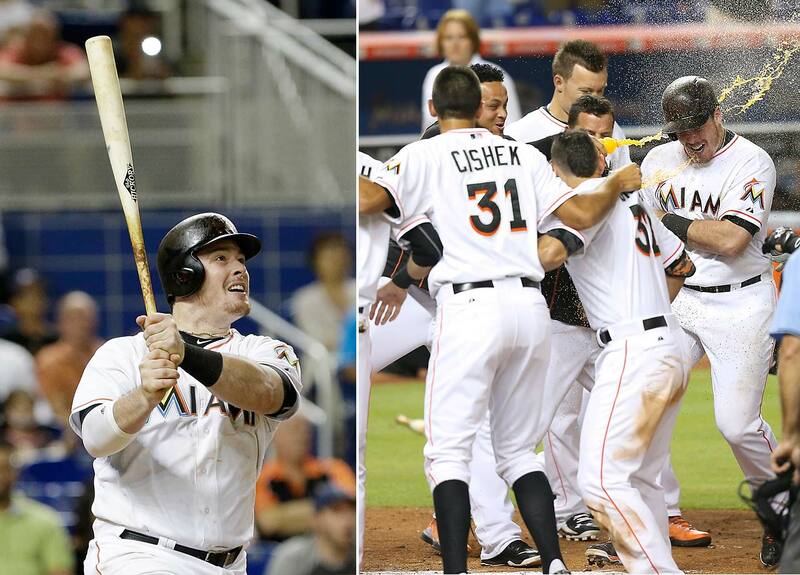 Justin Bour gave the Miami Marlins a 6-5 win over the San Francisco Giants with this three-run homer on July 1 at Marlins Park. 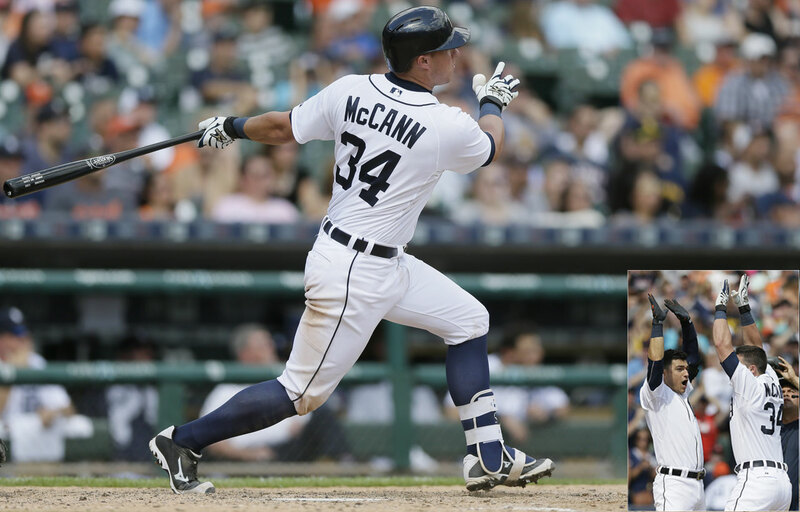 James McCann's solo shot off White Sox relief pitcher Zach Putnam gave the Detroit Tigers a 5-4 win in the ninth inning of a June 28 game. Gordon Beckham hit an 11th inning, solo home run on June 21 to give the Chicago White Sox a 3-2 victory over the Texas Rangers on June 21. Kenny Vargas hit a solo home run against St. Louis in the ninth inning on June 18 to give the Minnesota Twins a 2-1 victory. 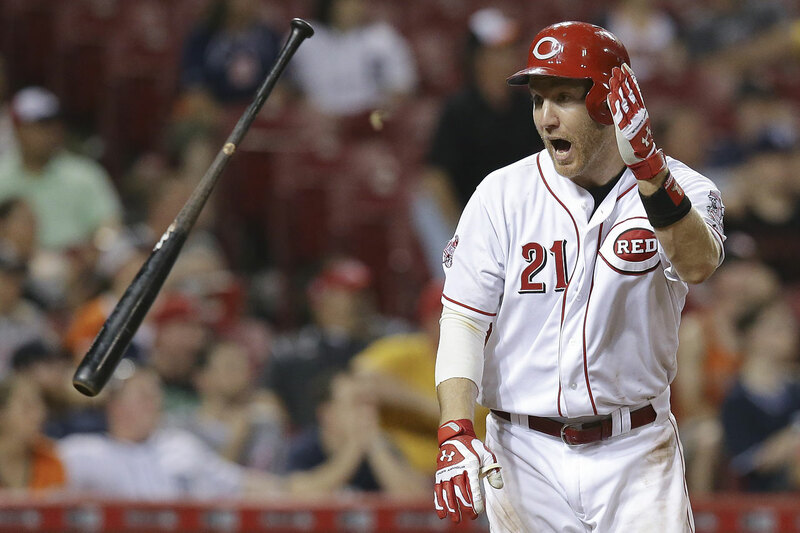 Todd Frazier hit a game-winning grand slam in the 13th inning against the Detroit Tigers to give the Cincinnati Reds an 8-4 victory in the wee hours of June 18. Robinson Chirinos lifted a ninth-inning shot out of Globe Life Park on June 16 to seal a 3-2 win over the Los Angeles Dodgers. 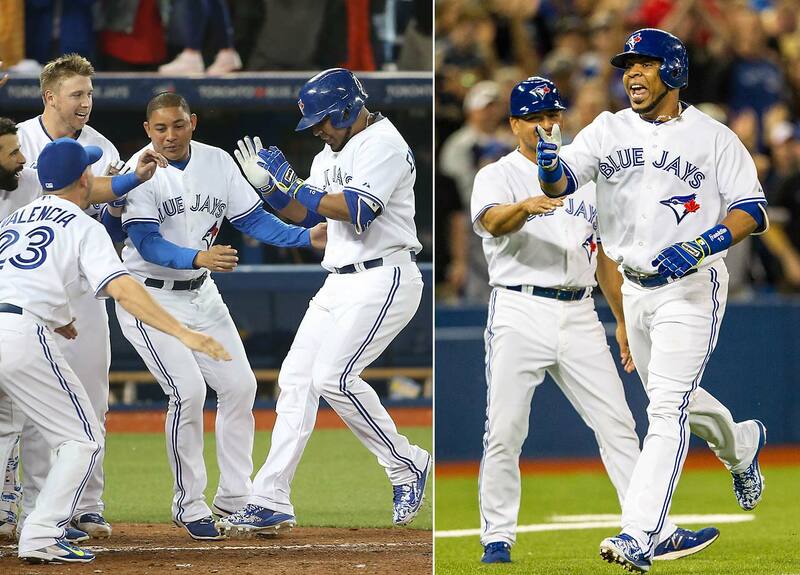 Edwin Encarnacion's two-run walk-off home run in the ninth inning on June 9 gave the Toronto Blue Jays a 4-3 victory over the Miami Marlins. 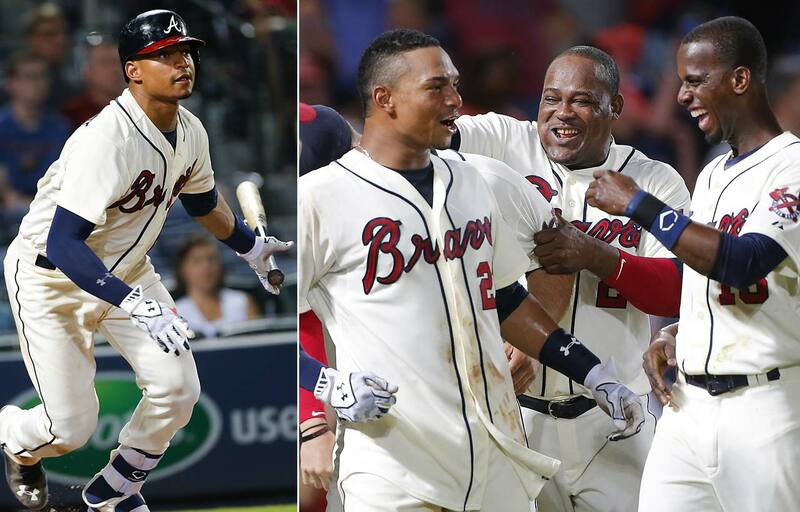 Christian Bethancourt lifted the Atlanta Braves to a 5-4 win over the Pittsburgh Pirates on June 6 with his walk-off home run in the ninth inning. 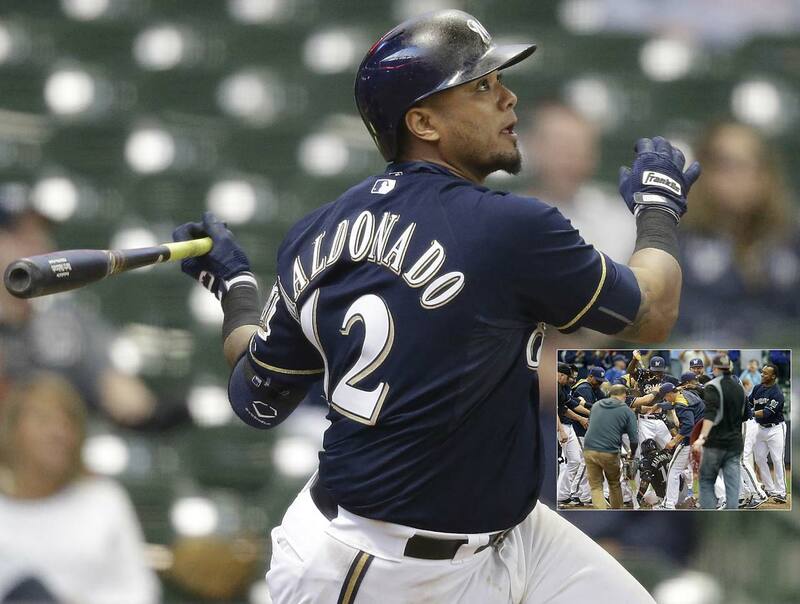 In a game that went 17 innings, Martin Maldonado delivered the closing blow with a game-winning homer that gave Milwaukee a 7-6 win over the Arizona Diamondbacks on May 31. 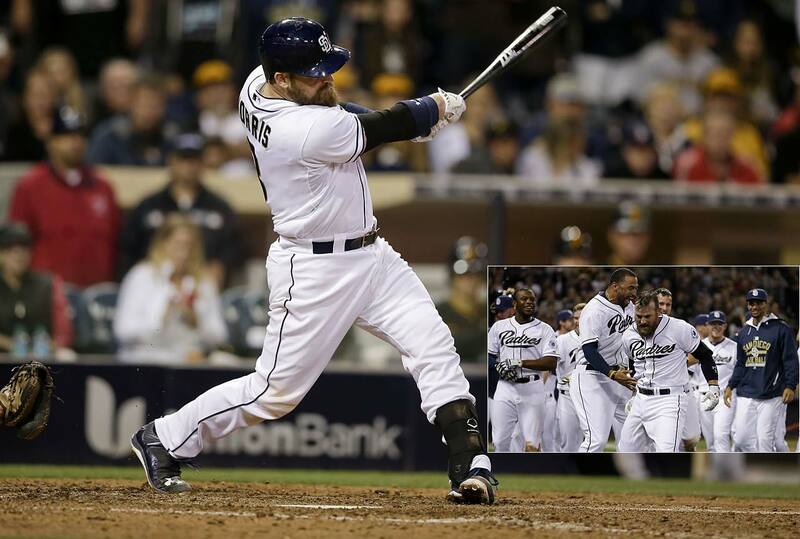 Derek Norris redeemed himself after four strikeouts when he blasted a grand slam in the ninth inning to give San Diego a 6-2 victory over the Pittsburgh Pirates on May 29. 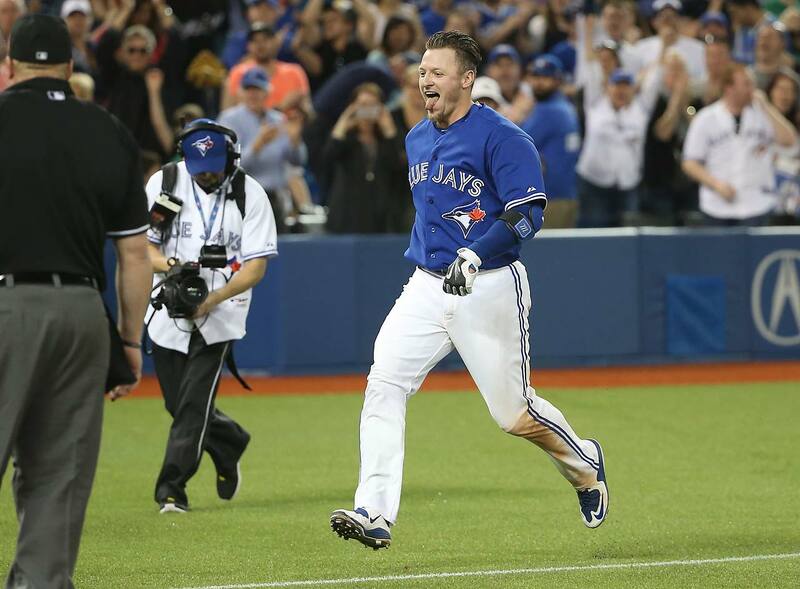 An ecstatic Josh Donaldson heads for home after giving the Toronto Blue Jays a 6-5 win over the Houston Astros on May 25 with a three-run walk-off homer in the ninth inning. 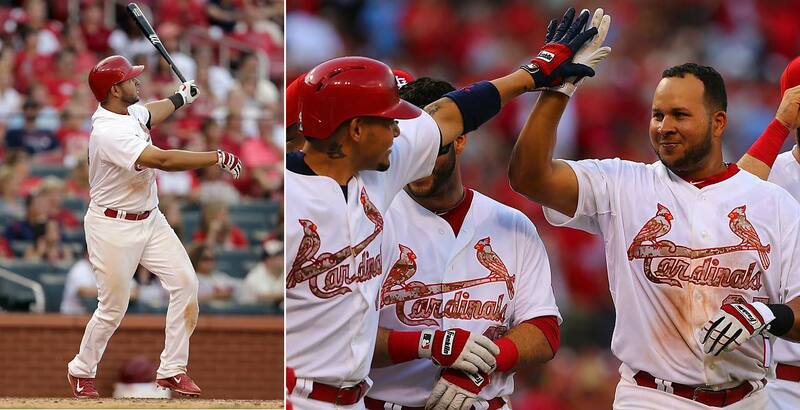 Jhonny Peralta delivered a solo shot in the 10th inning of the St. Louis Cardinals 3-2 win over the Arizona Diamondbacks on May 25. 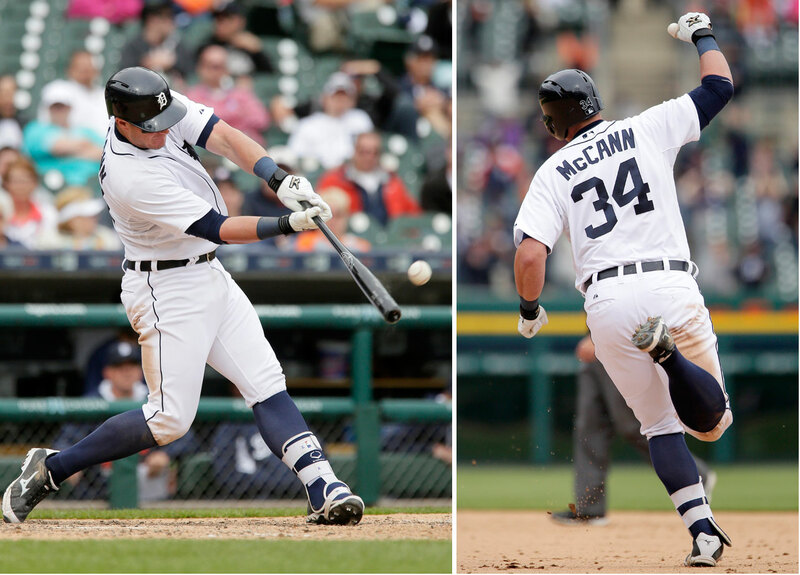 Detroit rookie catcher James McCann hit his second career homer in the 11th inning of a May 21 game against Houston, giving the Tigers a 6-5 win. 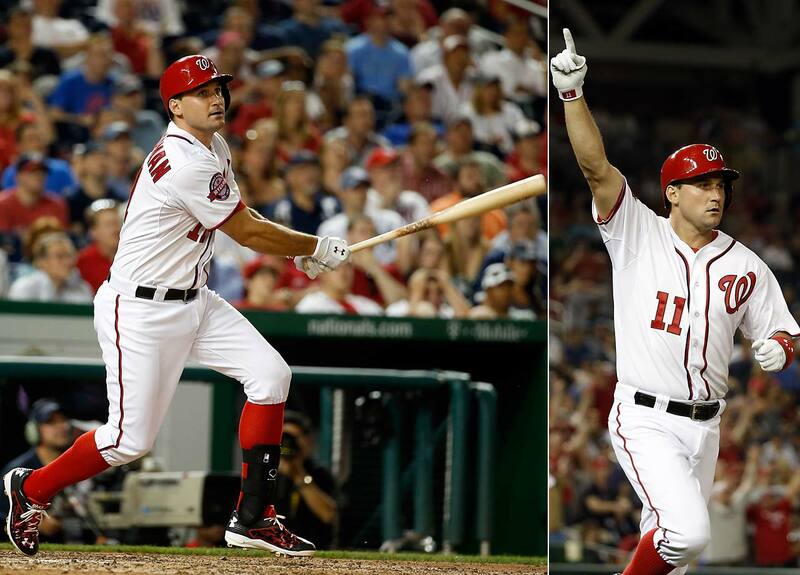 Ryan Zimmerman drilled a two-run walk-off homer against the New York Yankees to give the Washington Nationals an 8-6 victory in 10 innings on May 19. 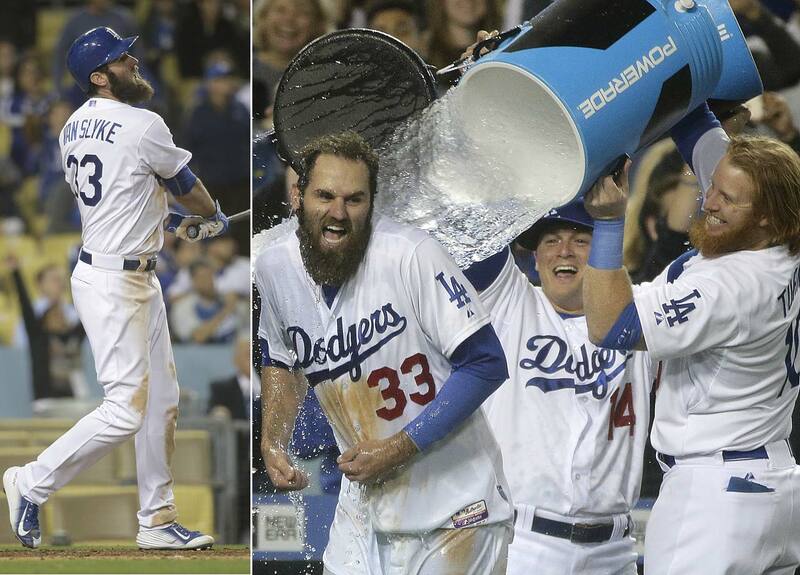 Scott Van Slyke got doused after his three-run walk-off home run in the ninth inning gave L.A. a 5-3 win over the Miami Marlins on May 11. 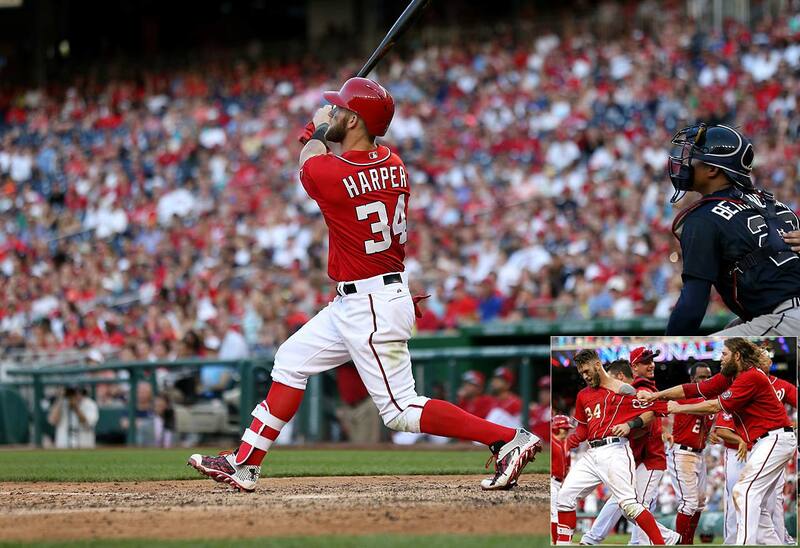 Bryce Harper watches his two-run walk-off homer in the ninth inning of an 8-6 win over Atlanta on May 9. 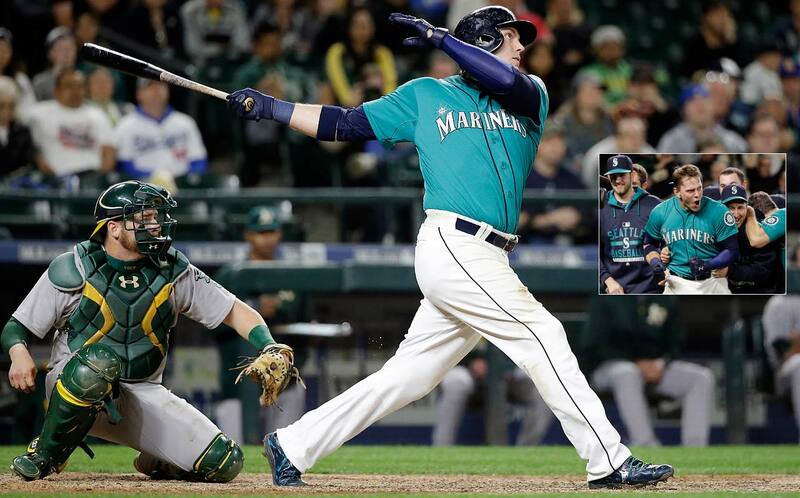 Logan Morrison's walk-off home run in the 11th inning of a May 8 game against the Oakland Athletics gave Seattle a 4-3 win. 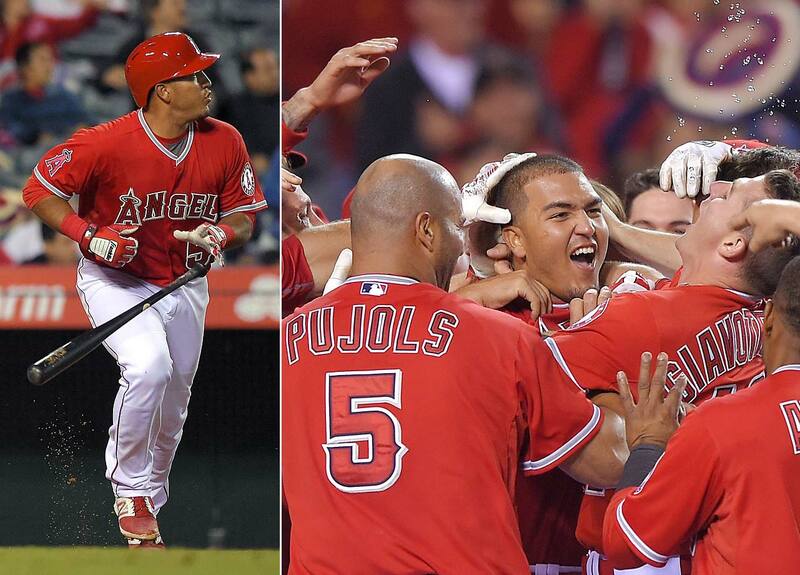 Carlos Perez’s walk-off during the ninth inning of a May 5 game against Seattle propelled the Angels to a 5-4 win. 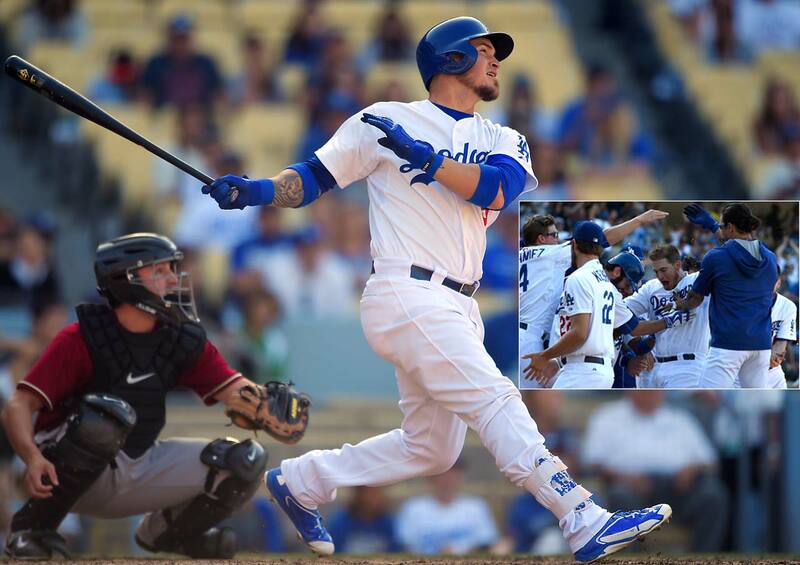 Yasmani Grandal of the Los Angeles Dodgers nails a pitch for the only run of the game, a 13th-inning walk-off homer against the Arizona Diamondbacks on May 3. 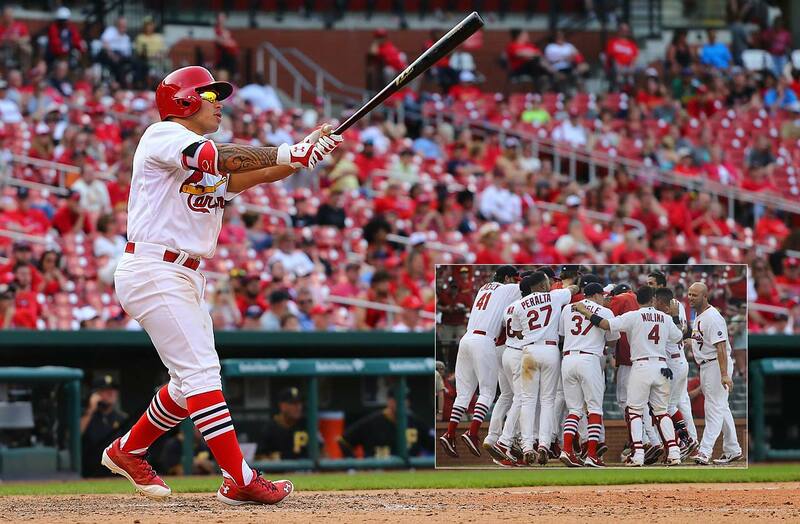 St. Louis second baseman Kolten Wong seals the 3-2 win for his team with a 14th-nning walk-off home run against the Pittsburgh Pirates on May 3. 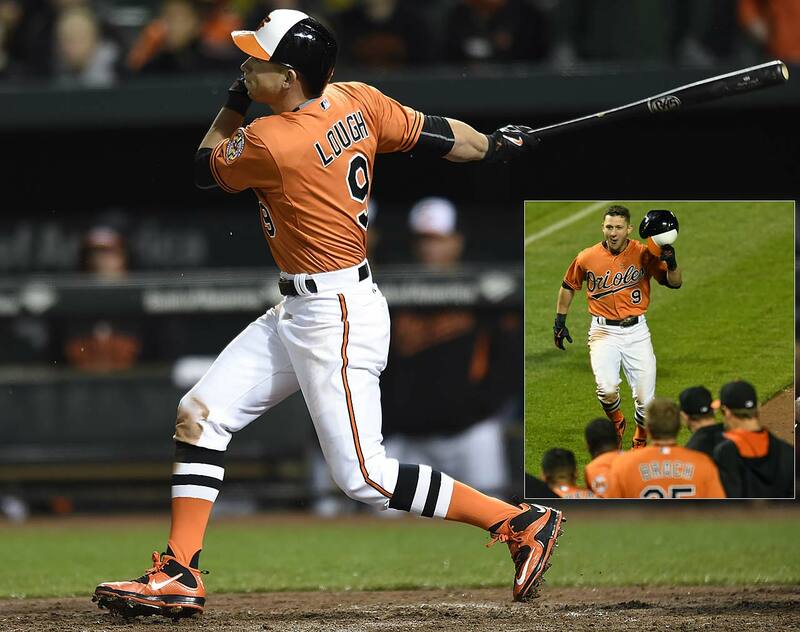 David Lough of the Baltimore Orioles hit a 10th inning walk-off homer against Boston on April 25 that gave the Orioles a 5-4 victory. 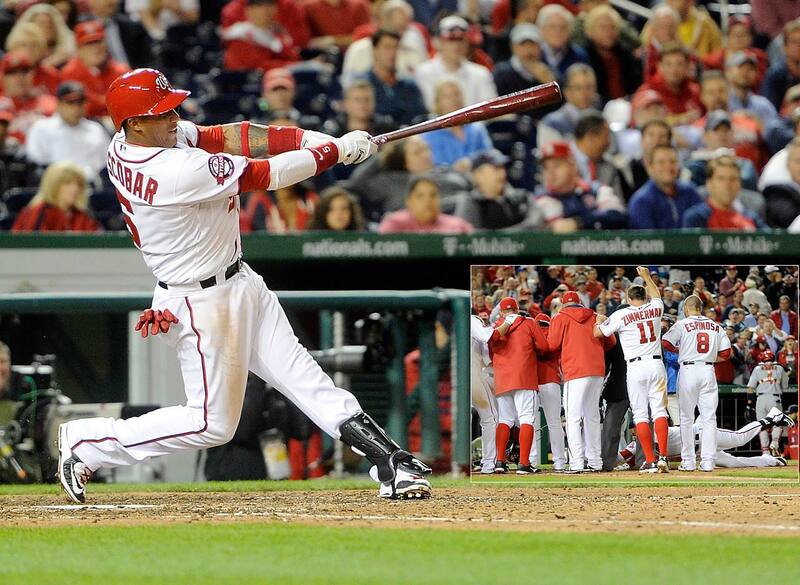 Yunel Escobar decided to slide into home plate after launching a 10-inning walk-off homer that gave the Washington Nationals a 2-1 win over St. Louis on April 21. 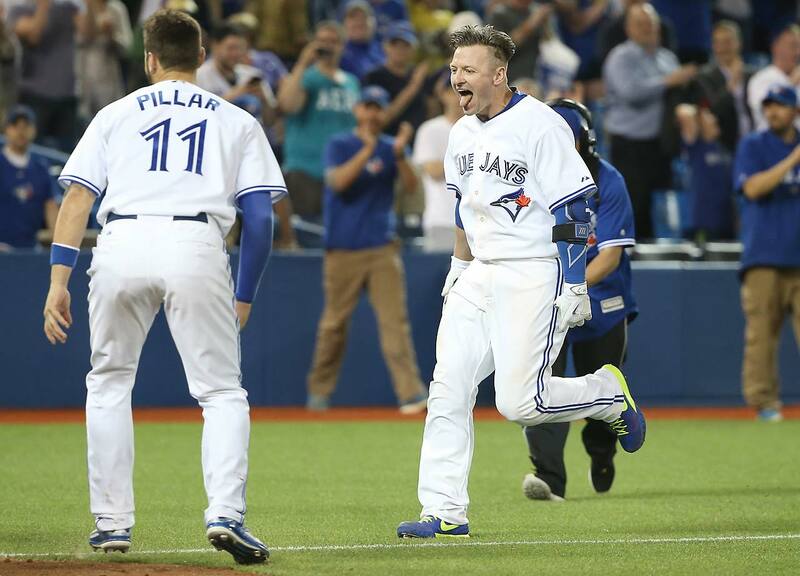 Josh Donaldson’s 10th inning heroics broke a 5-5 tie and gave the Blue Jays a walk-off win over the Atlanta Braves on April 18. 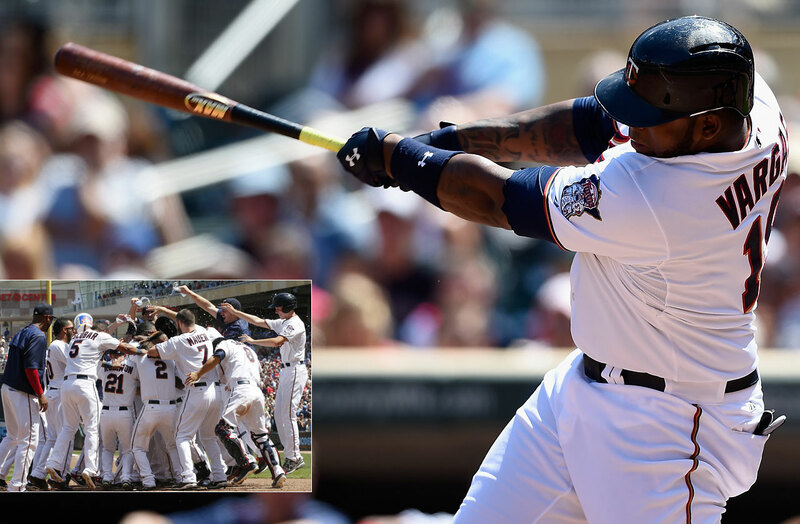 Trevor Plouffe of the Twins hit the first walk-off home run of the season, an 11th inning blast on April 17 that pushed Minnesota past Cleveland, 3-2.